Please note that we are unable to accept new repair or restoration projects until further notice. Thank you very much for your understanding and patience. Hans J. Schindhelm, Master Restorer. C.R.O.W. Inc. and HJS Design, were founded in 1986 by well known M.I. Hummel Master Artist Hans J. Schindhelm and have been operated by him since. Hans apprenticed with the W. Goebel Porzellanfabrik, the manufacturer of the famous M.I. 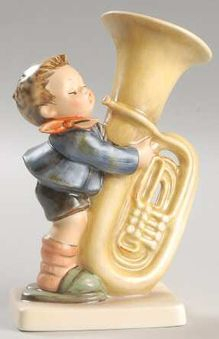 Hummel collectibles, from 1972 throughout 1975, and worked for the company in Germany until 1986 in a variety of prestigious positions such as Limited Edition Painter, Prototype Painter and Product Designer for Goebel's M.I. Hummel, Walt Disney, Lore, Gunther Granget-, European-, American- and African Wildlife Collectibles. During his tenure with Goebel he also completed his formal education and received his Masters Degree in the Ceramic Arts focused on manufacture, technology, restoration, conservation and teaching. He was also privileged representing W. Goebel Porzellanfabrik at numerous collectors conventions, trade shows, galleries and shops througout Europe and the United States, demonstrating for interested collectors the skills required to manufacture M.I. Hummel figurines. He still personally repairs and restores every piece that comes to his studio in Sleepy Hollow, New York to insure the highest level of workmanship possible. Many of the national / international collectors clubs and retailers recommend his repair & restoration services to their members and customers. Explore his services. Hans can be reached for more information regarding his services at 914-438-3903, daily between 12:00 PM and 4:00 PM EST, or you can email him. Your free, no obligation estimate will specify which options make the most sense for your item(s). Please click here to read what some of my clients had to say about my services. Explore the Collectibles Care Guide to learn everything you always wanted to know about your treasures.